This finely executed table consists of a superbly carved and shaped back board with central painted armorial of a stag and crown to the top. This leads down to an oval panel with finely carved face of a moustached gentleman, possibly the Lord of the Manor, with carved scrolling decoration to either side and wonderfully carved rosettes. The top is of solid oak with a carved and moulded edge leading down to a sophisticated front rail. The front rail consists of three recessed panels with moulded and carved embellishments to either side, the central panel being a concealed drawer and between each of the three panels are applied moulded dividers leading down to a shaped and carved frieze below of Gothic influence. 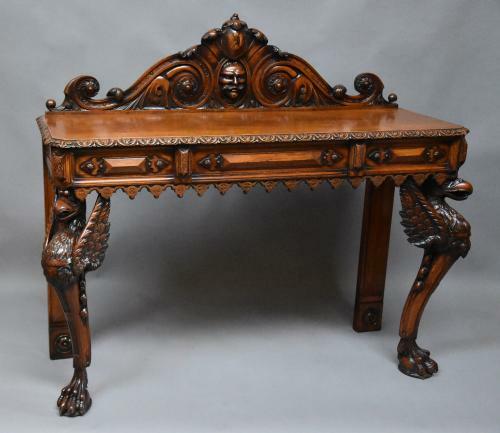 Each of the ends has an oak panel with moulded edge and shaped frieze, the front supports consisting of superbly carved winged griffins terminating with a ball and claw foot, the rear supports being of square form with applied paterae to the bottom. This table is in excellent condition for age, is of stable construction and can go straight into a home.